Welcome to Kwik Kar Marsh! We are Your Neighborhood Dealership Alternative proudly serving Addison, TX, Carrollton, TX, Dallas, TX, Farmers Branch, Plano, Frisco, Lewisville and surrounding areas. This is Kwik Kar Marsh, a great video showcasing the auto repair shop and customer lobby at Kwik Kar Marsh by Charlie Hudson. The Kwik Kar Marsh video was filmed, edited and directed by Charlie Hudson. Kwik Kar Marsh provides expert auto repair on all foreign and domestic vehicles as well as preventative maintenance. 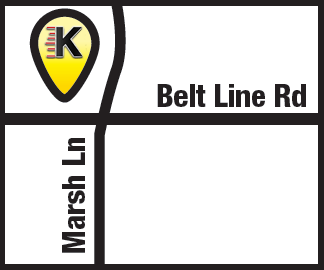 The location of Kwik Kar Marsh is conveniently located at 1049 Marsh Lane at Beltline Rd in Addison, Carrollton and Farmers Branch.